During 2011, we continued to develop a risk-based approach to safety, as managing safety is about managing the operational risks. At Cathay Pacific, this is primarily achieved through a risk-based Safety Management System (SMS), which was accepted by the Hong Kong Civil Aviation Department (HK CAD) in 2009. Hong Kong is still one of the few places in the world to have mandated an airline SMS, placing Hong Kong and Cathay Pacific at the forefront of safety management. Our SMS defines how we manage safety as an integral part of our overall business. With a view to ensuring that our staff understand how we use the SMS to manage safety and operational risk, and to demonstrate how they can contribute to safety management, in August 2011 we rolled out an SMS e-Learning package and knowledge test for CX staff. This was well received and results to date have shown that this has improved knowledge and general understanding throughout the organisation. During 2011, we updated and revised the way we measure and monitor our safety performance within the airline. We now have a number of prescriptive Safety Performance Targets that are split into three categories, comprising Safety Status Indicators, Operational Performance Indicators & Management Performance Indicators. When combined, they give a measure of operational safety, fatigue, security, occupational health and safety, quality and contingency planning. These metrics are documented and reviewed on a monthly basis by the Airline Safety Review Committee (ASRC) and, where possible these safety metrics are benchmarked against other airlines, industry performance and best practices. We continue to capture flight data from all flights operated by Cathay Pacific and through routine analysis of this data, we verify that the aircraft are operated in accordance with our normal procedures in a safe manner. We also encourage all staff to openly report all incidents, hazards, threats and errors, and safety concerns. By analysing data from these numerous sources, we are better able to manage safety on both a proactive and reactive basis. We audit the 75 ports into which we operate on a regular basis. We have also continued our work with IATA by assisting with the ISAGO (IATA Safety Audit for Ground Operations) initiative. ISAGO is an industry audit programme for ground handling companies that serve airlines. The audits are conducted in a globally standardised and consistent manner, with an aim to improve operational safety in the airport ground environment and to reduce damage to aircraft and equipment. We are constantly looking for ways to reduce aircraft damage on the ground, and there were a number of initiatives in 2011 that focussed in this area. Cathay Pacific was one of the initial six members to share data with IATA's Ground Damage Database, which now receives data from over 20 airlines and service providers. This initiative aims to identify trends that will lead to industry improvements, such as equipment changes or better guidelines for equipment users. We met with other oneworld partners to look at ground damage amongst the member operators. The Cathay Pacific Engineering Department also initiated an arrival inspection program whereby an engineer inspects all door areas before equipment is allowed to be positioned. Part of our responsibility involves assisting other airlines and the industry as a whole in improving safety. To help guide the management of global aviation safety, Cathay Pacific attended the IATA Incident Review Meeting in October which was a gathering of around 60 airlines and organisations from around the world to share information on incidents and accidents. In addition, the General Manager Corporate Safety chaired the IATA Safety Group meetings in both Dubai and Dallas. Corporate Safety Department staff also attended safety meetings run by the Association of Asia Pacific Airlines (AAPA), and presented at the International Society of Air Safety Investigators conference in the USA. Cathay Pacific staff sit on numerous IATA Committees covering many disciplines, such as Quality, Risk, Security, Cargo and Medical to ensure that both organisations learn from and influence the industry. In 2011, Cathay Pacific commissioned a leading international expert on aviation safety, Sir Charles Haddon-Cave, Q.C., to conduct a review of the safety systems and culture within Cathay Pacific, Dragonair, and Air Hong Kong. It was conducted over five intensive weeks in Hong Kong, where he held detailed conversations with all Directors, operational GMs, senior executives and many other staff including operating cabin crew and pilots. Sir Charles also attended various committee and safety action group meetings, including the ASRC and the FRMS Committees, as well as meeting with representatives of the Hong Kong Aircrew Officers Association and the Hong Kong Airline Pilots Association. Finally, he observed a couple of flights on the way to and from the UK, an experience which allowed him to observe important front-line operations. Seventy deliverable action points were collated from the Haddon-Cave safety review, covering a range of issues such as operational, technical, organisational, management, planning, risks, co-ordination between departments, staff development and culture. The next important step is to ensure we act upon the actions identified. A director has been assigned with the responsibility of oversight to each of the actions. 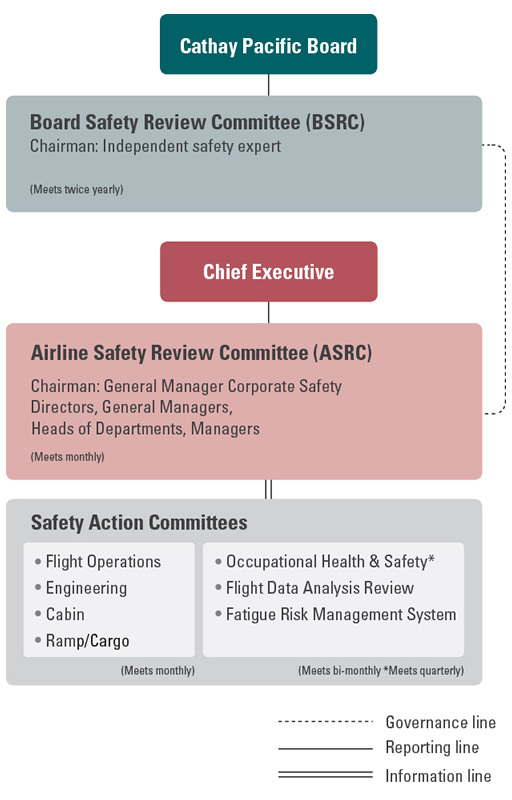 One action point that has already been addressed was the upgrade of the Head of Corporate Safety to General Manager status to reflect the importance of safety within the airline. Although the Haddon – Cave report made note of areas where Cathay Pacific can improve its safety systems and culture, he also found many areas where our existing procedures were world-class. "[At Cathay Pacific,] Safety is not a department or a meeting. It is a culture of open communication and cooperation with everyone working together every day to make our airlines the safest they can be. There is a great deal that Cathay does well or very well...". "Safety of our passengers and crew is front and centre of my responsibilities as chief of Cathay Pacific. I am confident that, consistent with this commitment, we have an excellent and well established safety programme. At the same time, even the best safety programmes always have room for improvement."